The White Divers of Broome Won the NSW Premier's Prize for Country and Regional History and the West Australian Premiers Prize. 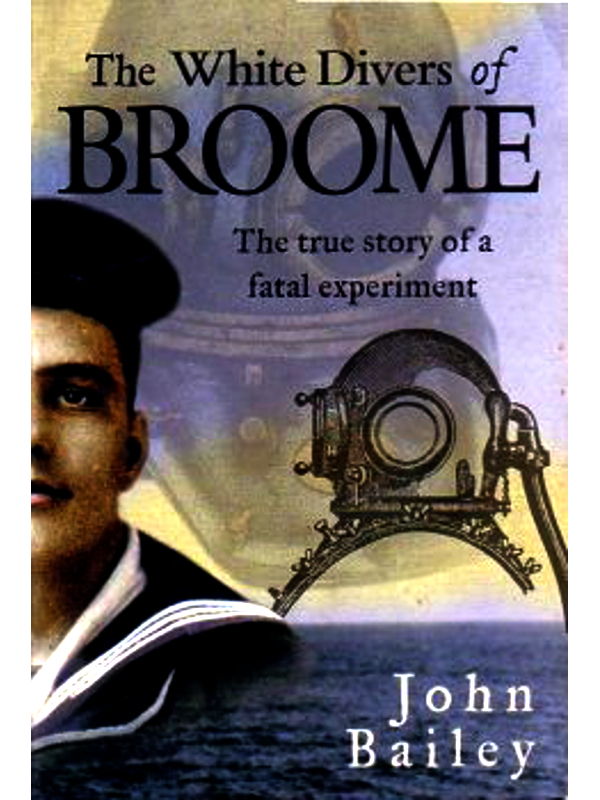 The White Divers of Broome was published in 2001. It was an immediate success, and has now been reprinted six times. It was short-listed for the Age Book of the Year, the Courier-Mail Literary Award, and the Victorian Premier’s Prize. It won the NSW Premier’s Award for Community and Regional History (presented by Ken Burns, the US doco maker), the Western Australian Premier’s prize for non-fiction, and the Historical Diving Society in England designated it the Book of the Year for 2002. An audio of the book has been recorded for the print-handicapped. The Black Swan Theater Company is to present a play written by Hilary Bell and inspired by the book at the Perth Festival in 2012. An extraordinary, compellingly written story that captures the brutalities, absurdities and raw excitement of frontier life in equal measure. Bailey enthralls us … A blend of Steinbeck, Hemingway and Maugham. With a dash of Hansard … A fascinating and important book. John Bailey possesses that special talent that makes a true story read like a rollicking tale of fiction, and his book, The White Divers of Broome, has quite rightly been compared to Simon Winchester’s The Surgeon of Crowthorne. It’s a riveting read that evokes an exotic and dangerous frontier Australia. Bailey has constructed a stirring narrative … he invests the past with new life … to animate early Broome and its seaways, with all their colour, eccentricity and brutality. He demonstrates anew how little we still know of a history which many misconstrue as bland, safe and comfortable. We are well served by books of this caliber which struggle to tell it like it was, not the way we might like it to have been. A dark, complex story, powerfully vivid, thanks to Bailey’s narrative flair. Bailey uses the techniques of a novelist to bring to life archival research in his examination of the ways in which White Australia went out of its way to handle what it felt was a stain on the nation: the use of Malays, Japanese and other non-whites as pearl divers in Broome. … The book offers a wonderful insight into a panic-ridden nation on matters of race and miscegenation even as it re-creates the narrative with immense dramatic force and immediacy. A wonderful read, this work captures and maintains the reader’s interest throughout. The White Divers of Broome demonstrates exemplary scholarship, careful use of archival and private records, and a strong sense of the interweaving of personal idiosyncrasy and political processes.